General Motors will stop production at the Chevrolet Corvette plant in Bowling Green, Kentucky for three months starting from August. It means anyone that's ordered a 2018 Corvette may not see their car delivered until December—at the earliest. Some 2018 models, including the special Carbon 65 Edition, have made it to dealer lots, though. We're also expecting a range-topping ZR1 added to the 2018 Corvette lineup soon. Cars Direct has managed to learn from a company spokesperson that the plant stoppage is due to some final work on a new paint shop. The new paint shop, when complete, will be 450,000 square feet, making it roughly half the size of the pre-construction Bowling Green plant. GM announced the paint shop in early 2015 and said at the time the upgrade would cost a substantial $439 million. And this is on top of a previous $135 million investment made four years prior to establish a new body shop as well as relocate the Performance Build Center from Michigan to the Bowling Green plant. News of the plant stoppage follows an announcement from GM that public tours at the Bowling Green plant would cease on July 16 for a period of roughly 18 months, ensuring the plant would be free from public eyes for some time. 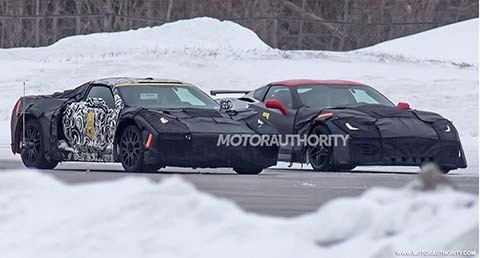 While not confirmed, there's the very strong possibility that all the upgrades plus the stoppage is in preparation for the vaunted mid-engine Corvette that's been spied testing for the past year. The car is rumored to debut at the 2018 Detroit auto show next January, as a 2019 model.